Eagles fan Kaitlyn Rivas screams as she realizes she and her 1-year-old son C.J. are being broadcast on the stadiums big screen during the open Eagles practice at Lincoln Financial Field in Phila., Pa. on Aug. 5, 2018. After the Eagles' 31-14 preseason loss to the Pittsburgh Steelers, the team will hold its second and final practice at Lincoln Financial Field that will be open to the public. While Saturday's practice is free and open to the public, you'll need a ticket to attend (tickets went fast when they were offered on Ticketmaster in July). 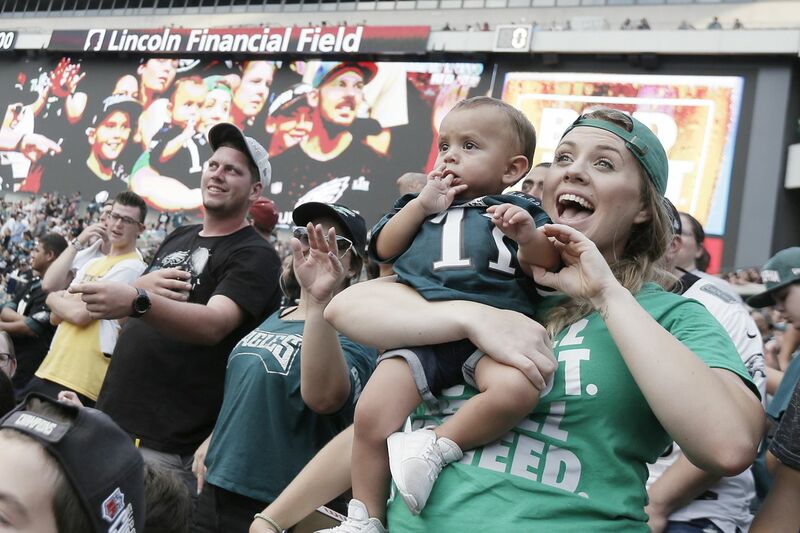 More than 40,000 fans attended the Eagles first open practice last Sunday, nearly double the 23,000 that filled the stands for the team's first open practice at the Linc last year. "It was the most I've seen at the Linc for an open practice," my colleague Jeff McLane wrote. "The crowd was animated. There were competing E-A-G-L-E-S chants throughout the stadium, a wave, and the only boos heard came when some unfortunate soul was caught wearing an Ezekiel Elliott Cowboys uniform." Time: Gates open at 8:30 a.m.. Practice is scheduled to begin at 10 a.m. In addition to the Eagles' practice, the open event will also feature activities throughout the stadium, including face painting and alumni autograph sessions. As part of family day, the Eagles will be holding a Kids Run the Show promotion that will allow some young contest winners to interview an Eagles player and catch a pass from one of the team's four quarterbacks. As with every training camp session, staff writers Zach Berman, Jeff McLane, Les Bowen and Paul Domowitch will be covering all the action live on Twitter. Notes and observations about the the day's practice will be at philly.com/eagles. Our Early Birds newsletter also includes practice highlights. Mock game walkthrough. Closed to the media. The team has held a few open practices at the Linc each year since 2013, when the Eagles moved camp from Lehigh University to Philadelphia. Doug Pederson opted to keep the camp in Philly when he became head coach. While fans could watch the team most days at Lehigh, the practices at the Linc have drawn larger crowds than the out-of-town sessions.